Its that time of year when winter looms long, and we’re all spending a bit too much time indoors. Are the throw pillows on your couch getting a bit faded? Want to update your décor? Enter sweater pillows! 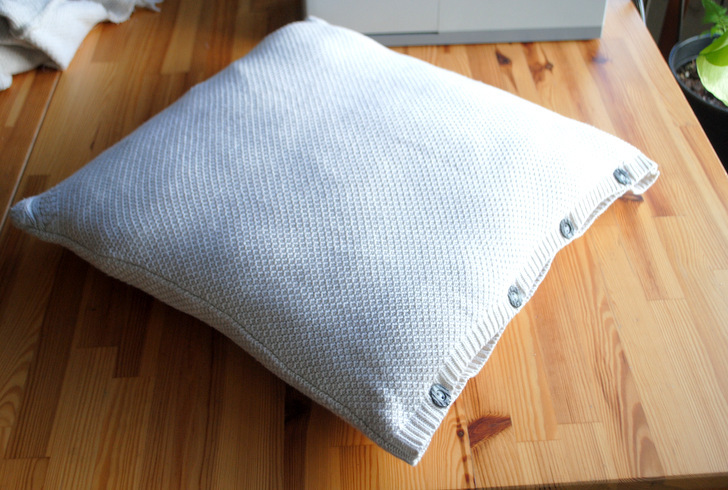 Just follow our tutorial to learn how you can battle cabin fever by creating cozy new cold-weather-friendly pillow covers from recycled sweaters. Read on and we’ll show you how to sew two different types of pillow covers: one with an envelope style closure, and a chic version with a button hem. Making pillows out of old sweaters is easy to do, and has the double bonus of upcycling materials, and making your house even cozier. For the buttoned pillowcase, start by smoothing out and pinning together the two sides of the bottom hem – this will form the opening of the pillowcase. Pinning will keep the sweater hem from stretching out and getting misshapen when you sew it. With a colored pencil or chalk, use a ruler or measuring tape to mark out a square that is approximately ½ inch larger than your pillow measurements on all sides. 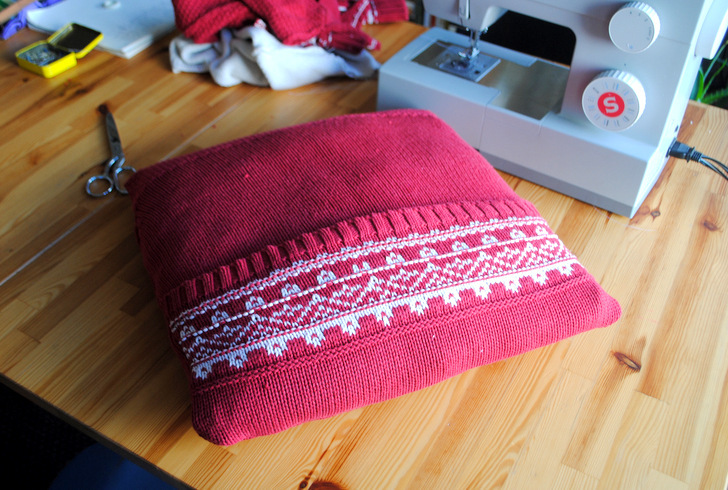 For the button pillow, we only needed to cut two sides of the sweater to create the right size square: the bottom hem forms the opening, and the right seam we left intact. 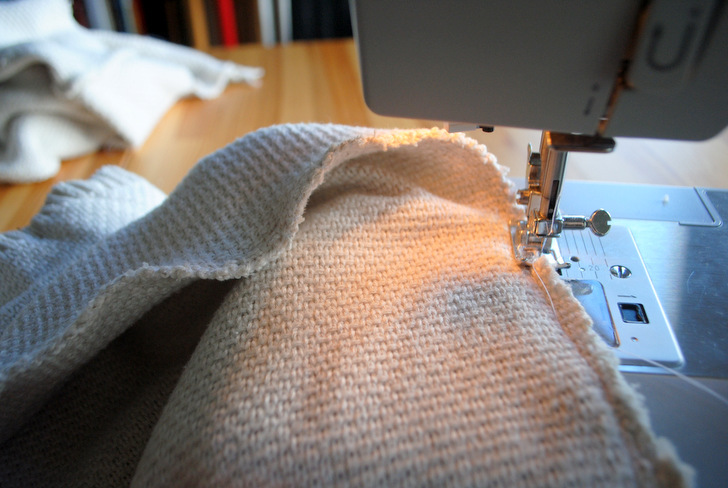 Using a wide straight stitch, slowly sew the seam you just marked on the two sides of the square, being cautious not to stretch the sweater too much, which can pucker the seam. Trim off the excess sweater material, close to the seam you just created. 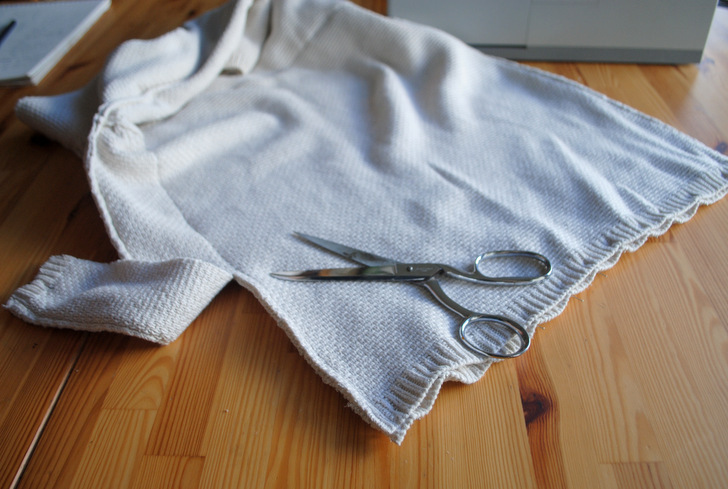 Once you’ve cut out the complete square, finish the newly cut seam edges with a zig-zag or overlock stitch, to keep the sweater seam from unraveling. Turn the pillow right-side out and remove the pins along the hem. 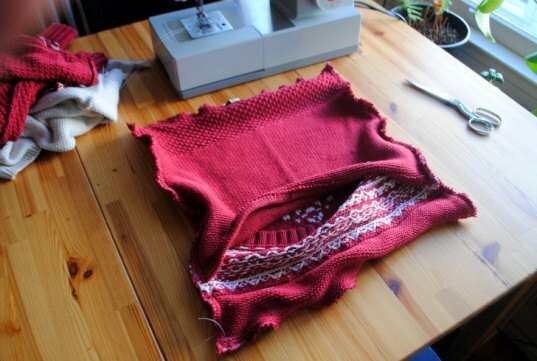 Measure out and mark a spot for 4 equally spaced buttons along the inside edge hem of the sweater. Use a needle and thread to hand sew the buttons on. Next, mark out four corresponding spots on the upper hem with a pin. Using scissors, snip a tiny hole and unravel it just large enough for each button. 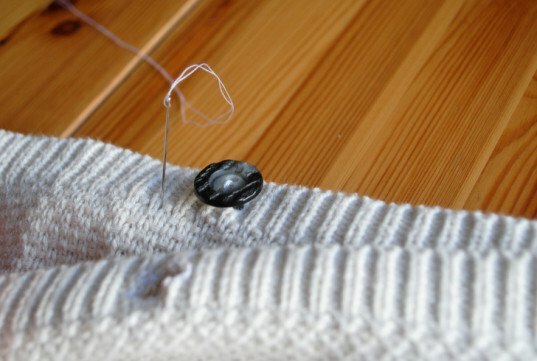 Use a needle and thread to hand sew the edge of the buttonhole so the yarn doesn’t continue to unravel. Place the pillow inside the new pillowcase and button it shut – you’re done! 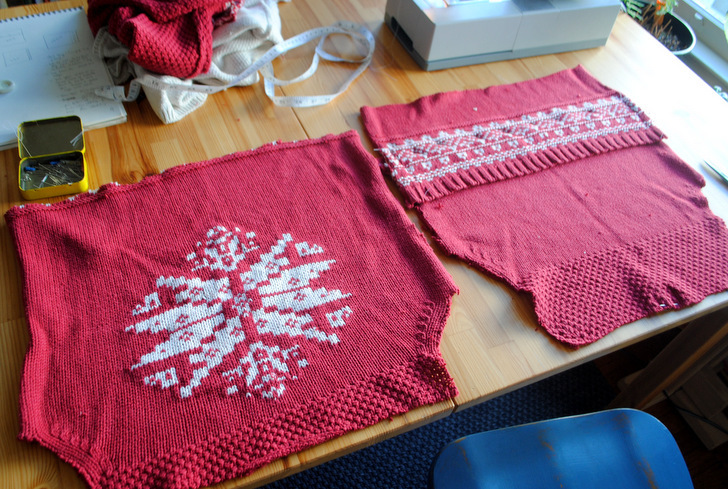 Next, measure out two overlapping pieces – we used the sweater’s border here – to form the envelope back. The two pieces must overlap at least 3-5 inches, and when overlapped, should form the same measurements as above (a square approximately ½ inch wider than the pillow measurements). Pin together the envelope back with the two pieces overlapped 3-5 inches. Ensure that you have them aligned evenly, then pin securely together. Stitch the side seams together just where the two pieces overlap. Place the two pieces together, right sides together, and pin securely. Slowly sew all four edges of the pillow together using a wide straight stitch, moving slowly so as not to pucker the fabric too much. Finish the edges of all four seams with a zig zag stitch to prevent the sweater from unraveling. Turn the pillow right side out through the envelope opening. Insert the pillow and smooth it shut. Toss your cozy new cushions on your bed, a chair, or the couch and enjoy! Lead image via Shutterstock; all other photos by the author. This is the most awesomest DIY tutorial ever! Its that time of year when winter seems like it will never end, and we're all spending a bit too much time indoors. Are the throw pillows on your couch getting a bit faded? Want to update your décor? Enter sweater pillows! 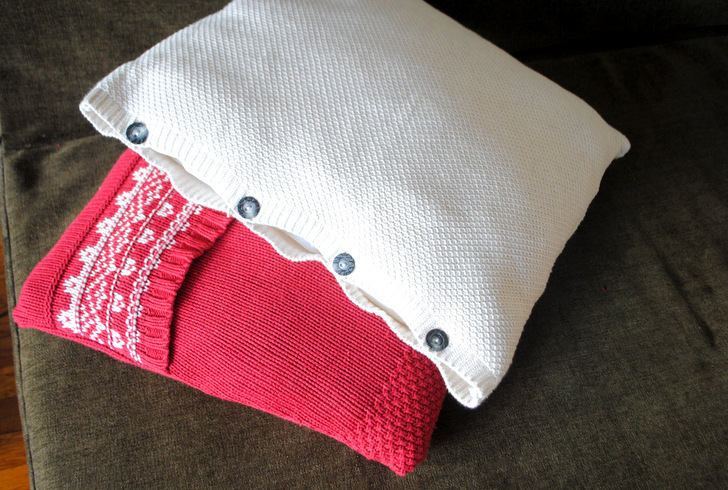 Just follow our tutorial to learn how you can battle cabin fever by creating cozy new cold-weather-friendly pillow covers from recycled sweaters. Read on and we’ll show you how to sew two different types of pillow covers: one with an envelope style closure, and a chic version with a button hem. Button Pillow Step 1: Measure and Mark For the buttoned pillowcase, start by smoothing out and pinning together the two sides of the bottom hem – this will form the opening of the pillowcase. 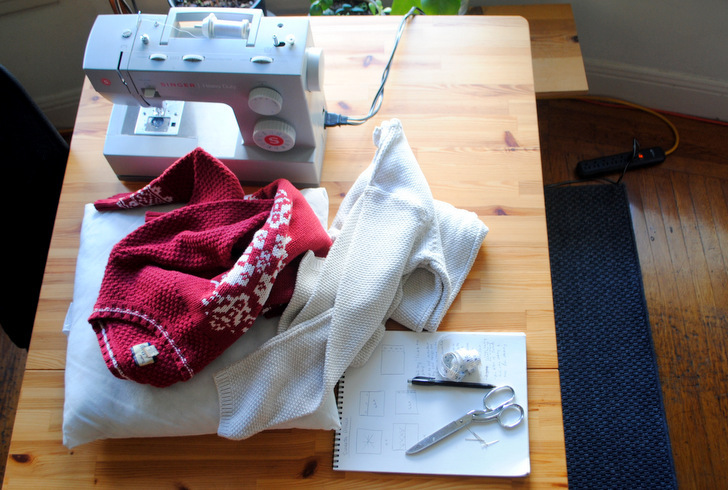 Pinning will keep the sweater hem from stretching out and getting misshapen when you sew it. With a colored pencil or chalk, use a ruler or measuring tape to mark out a square that is approximately ½ inch larger than your pillow measurements on all sides. For the button pillow, we only needed to cut two sides of the sweater to create the right size square – the bottom hem forms the opening, and the right seam we left intact. Button Pillow Step 2: Sew And Cut Sides Using a wide straight stitch, slowly sew the seam you just marked on the two sides of the square, being cautious not to stretch the sweater too much, which can pucker the seam. 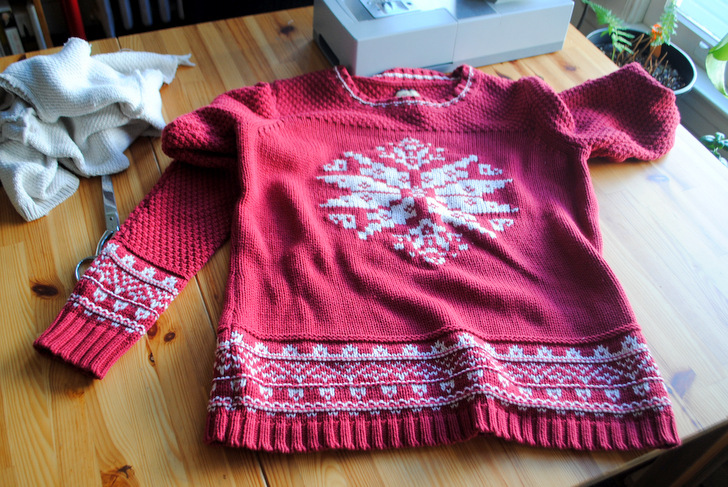 Trim off the excess sweater material, close to the seam you just created. Button Pillow Step 3: Add Buttons Turn the pillow right-side out and remove the pins along the hem. 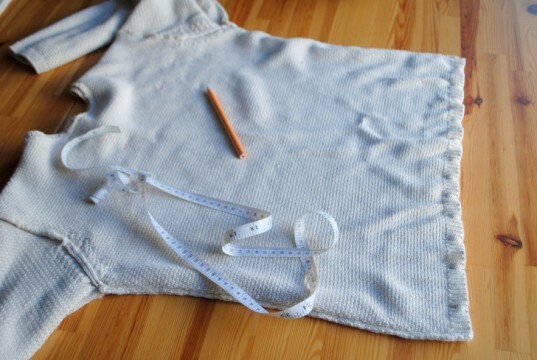 Measure out and mark a spot for 4 equally spaced buttons along the inside edge hem of the sweater. Use a needle and thread to hand sew the buttons on. Next, mark out four corresponding spots on the upper hem with a pin. Using scissors, snip a tiny hole and unravel it just large enough for each button. Use a needle and thread to hand sew the edge of the buttonhole so the yarn doesn't continue to unravel. Envelope Pillow Step 1: Measure and Mark Unlike the button pillow, you’ll be cutting three pieces for this version. Start by using a colored pencil or chalk and a ruler to mark out a square that is approximately ½ inch larger than your pillow measurements on just the front half of the sweater (or the part you intend to use for the front of the pillow). Cut this piece out - but be careful not to cut through both layers like you did for the button pillow. 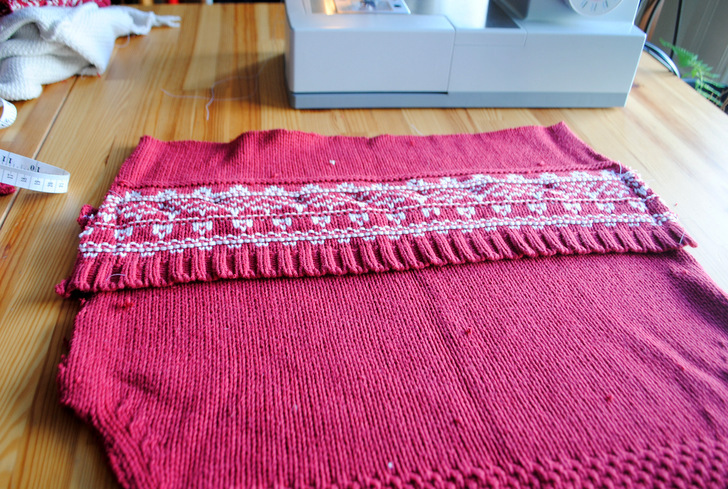 Next, measure out two overlapping pieces – we used the sweater’s border here – to form the envelope back. The two pieces must overlap at least 3-5 inches, and when overlapped, should form the same measurements as above (a square approximately ½ inch wider than the pillow measurements). Button Pillow Step 4: Finish Pillow Place the pillow inside the new pillowcase and button it shut – you’re done! Envelope Pillow Step 2: Create Pillow Back Pin together the envelope back – with the two pieces overlapped 3-5 inches. Ensure that you have them aligned evenly, then pin securely together. Stitch the side seams together just where the two pieces overlap. Envelope Pillow Step 3: Sew Pillow Together Place the two pieces together, right sides together, and pin securely. Slowly sew all four edges of the pillow together, using a wide straight stitch and moving slowly so as not to pucker the fabric too much. Finish the edges of all four seams with a zig zag stitch to prevent the sweater from unraveling. Envelope Pillow Step 4: Finish Pillow Turn the pillow right side out through the envelope opening. Its that time of year when winter looms long, and we're all spending a bit too much time indoors. Are the throw pillows on your couch getting a bit faded? Want to update your décor? Enter sweater pillows! 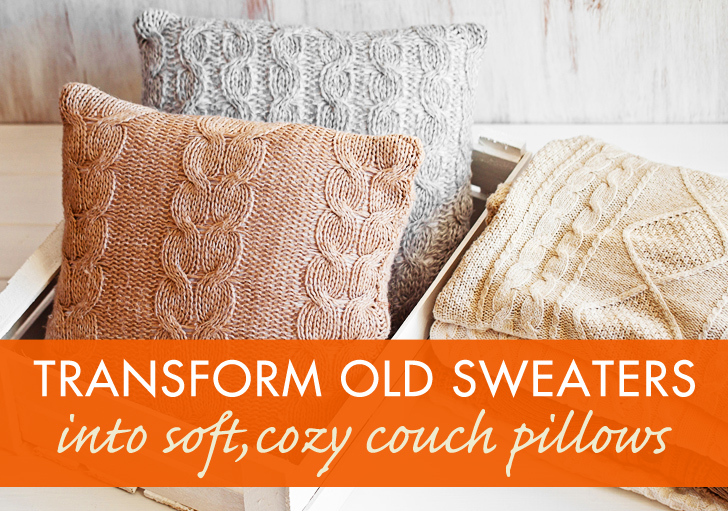 Just follow our tutorial to learn how you can battle cabin fever by creating cozy new cold-weather-friendly pillow covers from recycled sweaters. Read on and we’ll show you how to sew two different types of pillow covers: one with an envelope style closure, and a chic version with a button hem.